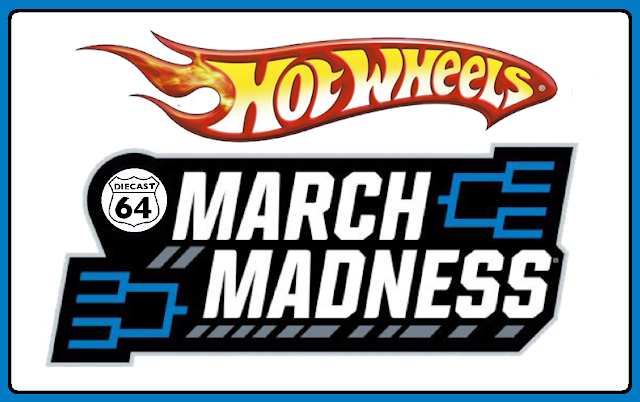 Hey, we got a cool race coming up, Hot Wheels March Madness. It is a winner take all Rip’n’Race. You can enter up to 2 cars per person, so if other family or friends want to send in cars at the same time to save on shipping that’s cool. Cars should be unopened in the package Hot Wheels brand cars. The deadline is March 18th. Racing will start the following week. 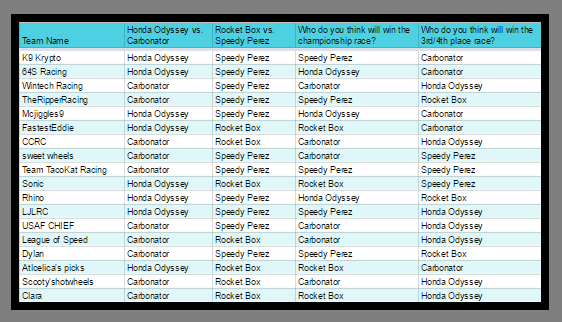 Include your name and a “team” name as well as a mailing address to ship the cars to if you win. 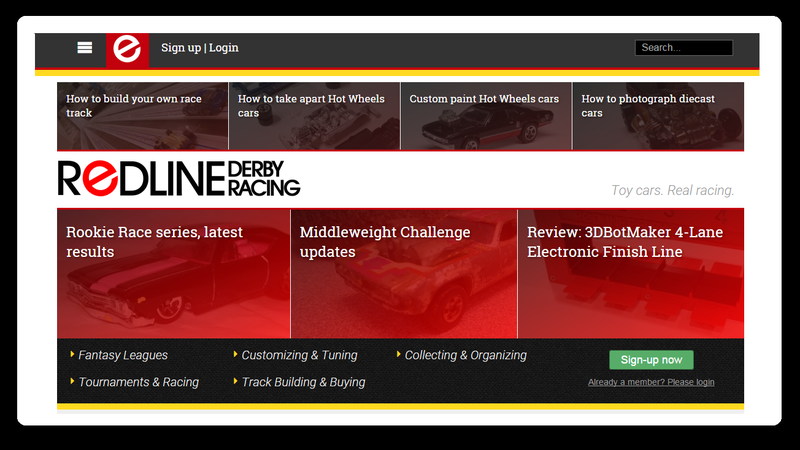 If you send cars for more than one person in the same package be sure to include each person's info and who’s racing which cars. Check out the results of the 2017 Hollywood Road Race. 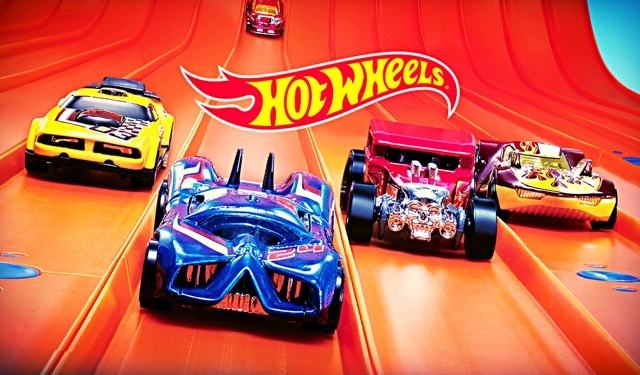 We're closing in on the end of Season 1 of the Hot Wheels Pick'em game. This is our last regular week. Next week we will race all eight weekly winners to find the fastest car of Season 1. For those new to the Pick'em game, each week you get to see if you can pick the winner for 4 races. You get points for correct picks and point totals are kept for the whole season. This is Week 8 of season 1. We'll be racing 4 new 2017 mainline cars this week. Each week there are a possible 6 points up for grabs. One point for each first round winner that you pick and 2 points for picking the finals winner and 2 points for picking the winner of the 3rd/4th place race. Results and video of the races will be posted at the end of the week. Hope you have fun this season! Let's get to it. Here are the cars for this week's match-ups. Here are the results from Week 8. Team scores will be updated tomorrow and found below the video on this post. Be sure to make your picks for The Season 1 Championship Bracket HERE. We're closing in on the end of Season 1 of the Hot Wheels Pick'em game. Just two weeks left before the Final. 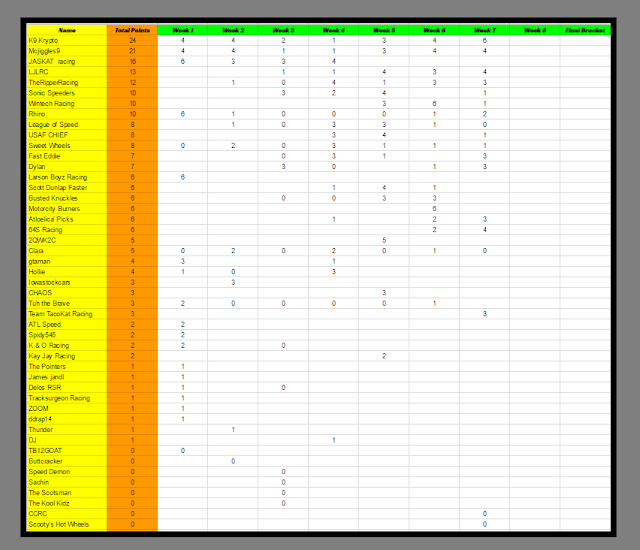 For those new to the Pick'em game, each week you get to see if you can pick the winner for 4 races. 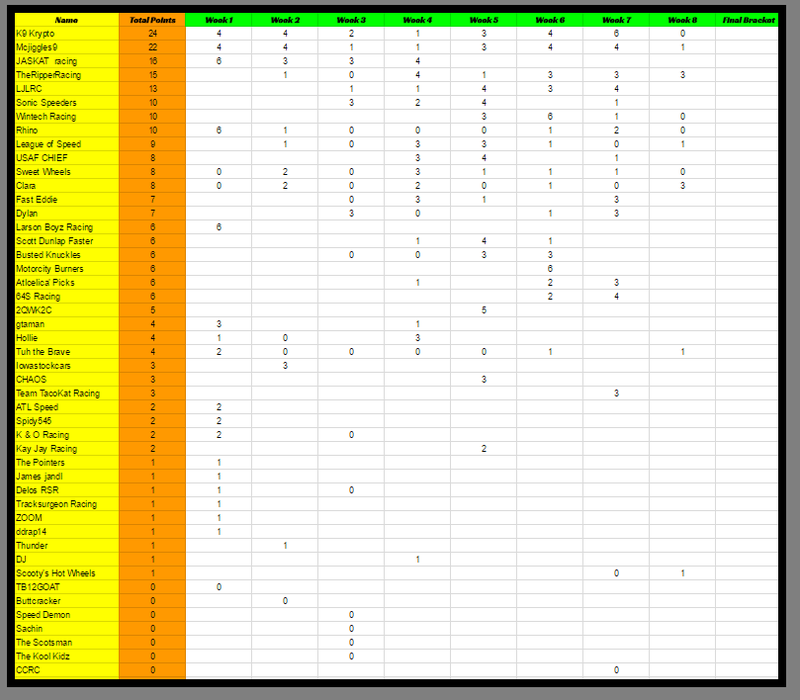 You get points for correct picks and point totals are kept for the whole season. This is Week 7 of season 1. We'll be racing 4 new 2017 mainline cars this week. Each week there are a possible 6 points up for grabs. One point for each first round winner that you pick and 2 points for picking the finals winner and 2 points for picking the winner of the 3rd/4th place race. Results and video of the races will be posted at the end of the week. Hope you have fun this season! Let's get to it. Here are the cars for this week's match-ups. The Hot Wheels Pick'em game is going strong. 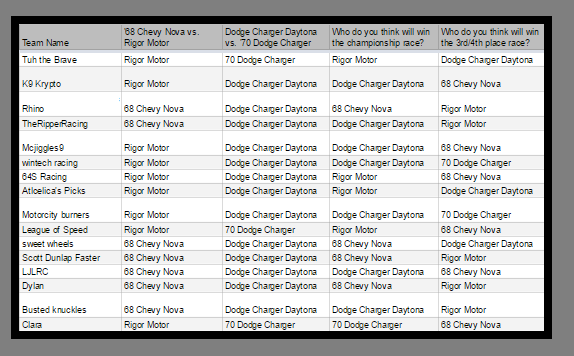 For those new to the Pick'em game, each week you get to see if you can pick the winner for 4 races. You get points for correct picks and point totals are kept for the whole season. This is Week 6 of season 1. We'll be racing 4 new 2017 mainline cars this week. Each week there are a possible 6 points up for grabs. One point for each first round winner that you pick and 2 points for picking the finals winner and 2 points for picking the winner of the 3rd/4th place race. Results and video of the races will be posted at the end of the week. Hope you have fun this season! Let's get to it. Here are the cars for this week's match-ups. Here are the results from Week 5. Team scores will be updated tomorrow and found below the video on this post. Be sure to make your picks for Week 7 HERE. It's truck week here on the Hot Wheels Pick'em game. For those new to the Pick'em game, each week you get to see if you can pick the winner for 4 races. 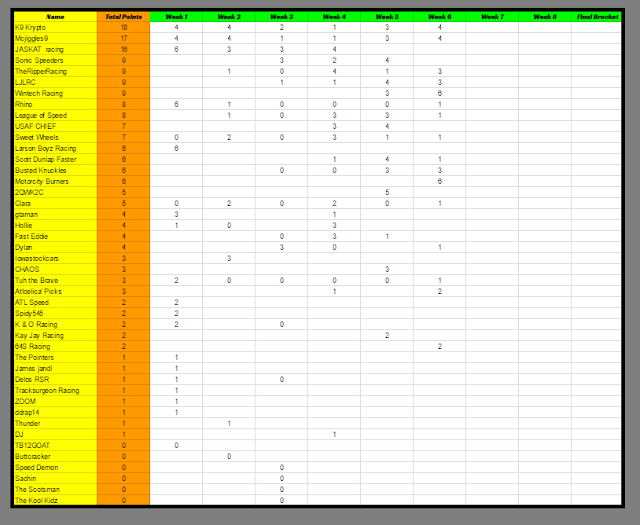 You get points for correct picks and point totals are kept for the whole season. This is Week 5 of season 1. We'll be racing 4 new 2017 mainline cars this week. Each week there are a possible 6 points up for grabs. One point for each first round winner that you pick and 2 points for picking the finals winner and 2 points for picking the winner of the 3rd/4th place race. Results and video of the races will be posted at the end of the week. Hope you have fun this season! Let's get to it. Here are the cars for this week's match-ups.